Eighteen pencil drawings from 1943 are the silent witnesses to the outrages that were perpetrated in and around Sobibor. A man named Joseph Richter recorded transports and prisoners on snippets of paper or torn off pieces of newspaper. Richter usually signed the sketches with his initials and the year. 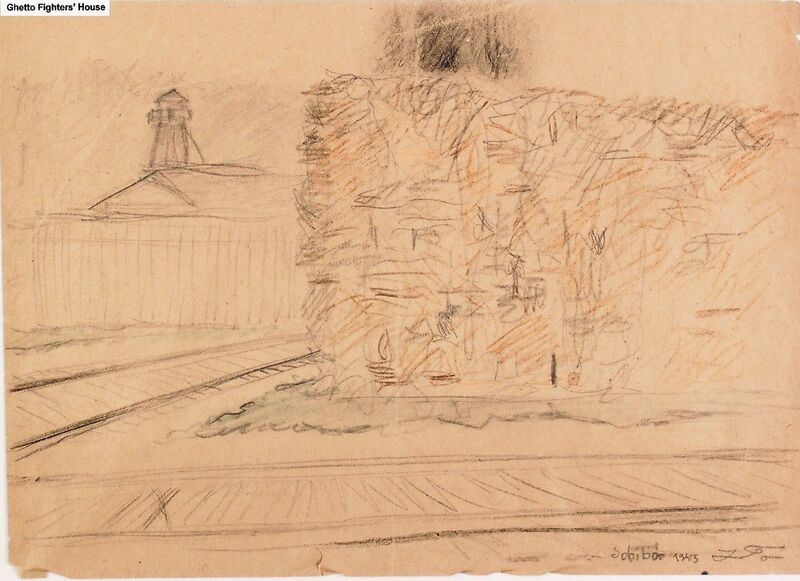 He made his drawings in grey pencil; he only used colours in the drawing of the fence around Sobibor. The only other time there is colour in his work is in a portrait of four Sobibor prisoners that was drawn on a piece of pink paper. Richter’s identity is shrouded in mystery. 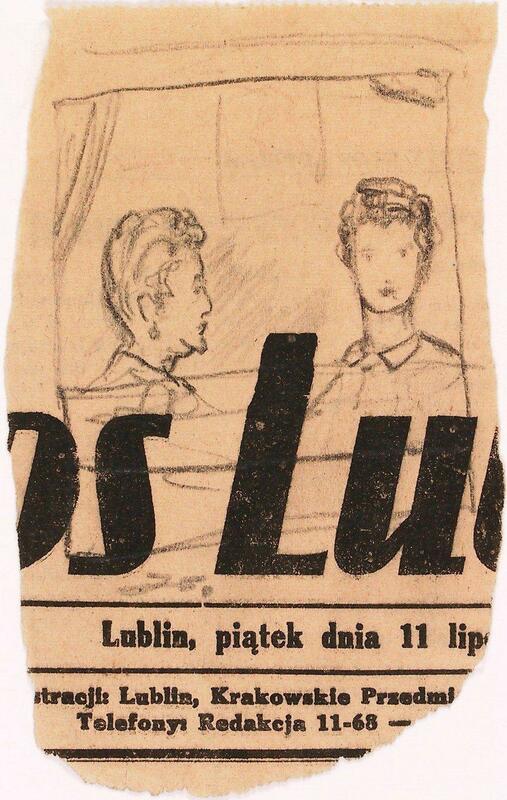 The notes he made in pencil on the back of his sketches are in Polish. Was Joseph Richter a Pole? Was he an escaped Jew? He apparently had some freedom of movement because on the drawings he wrote down various places in the vicinity of the camp: Lublin, Trawniki, Uhrusk and Sobibor. The only information we have is about the death of Joseph Richter: he joined the partisans and he was probably killed during a skirmish. After the war his drawings were found on a farm in Chelm, near Sobibor. Since then the Ghetto Fighter’s House Museum in Israel has had Richter’s pencil drawings in trust. Shown on this website are the sketches related to Sobibor. 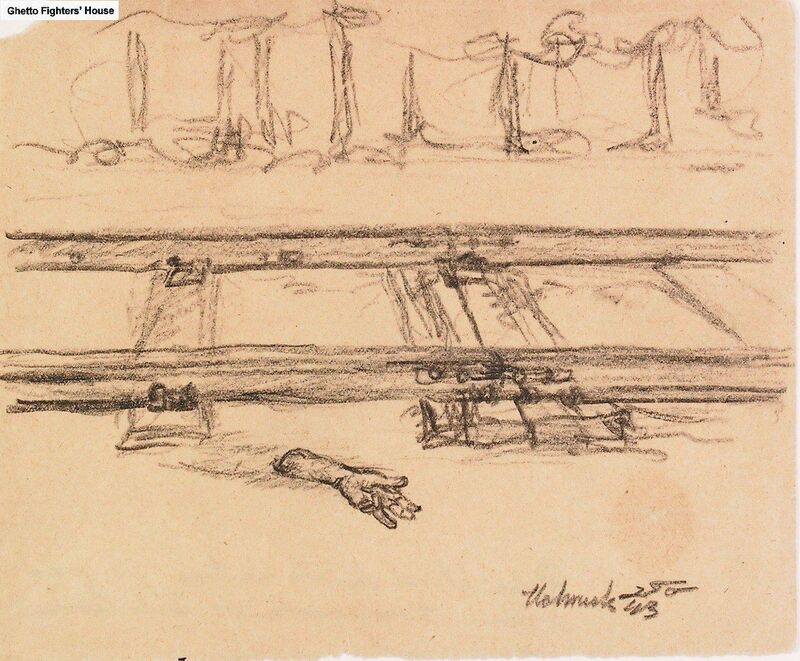 On the back of this drawing is written in pencil in Polish: "A hand left next to the track after a transport to Sobibor had passed". 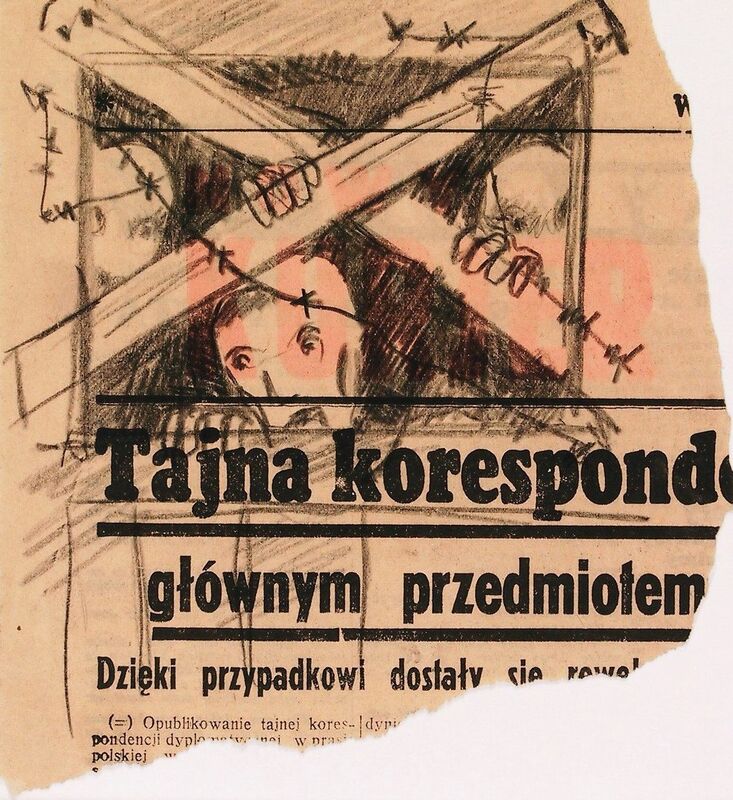 On the <?xml:namespace prefix = mce />back of this drawing i s written in pencil in Polish: "A wood near camp Sobibor. [woman] escapes from a transport. On the last wagon a machine gun. The forest is not dense". 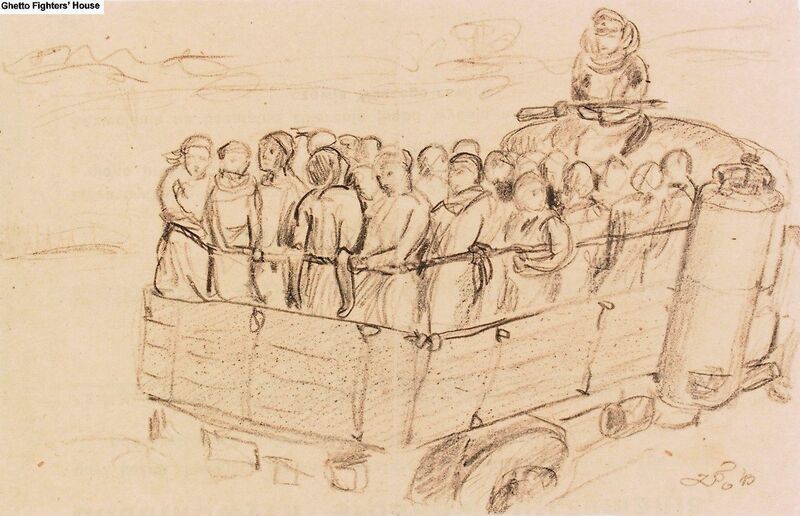 On the back of this drawing is written in pencil in Polish: "The transport on the way to camp Sobibor. We stood beside the track in railway uniforms holding some tools. We stood perfectly still and in sight so nobody would suspect we were escaped Jews. Below, past the track is the place where the dead bodies are burned". 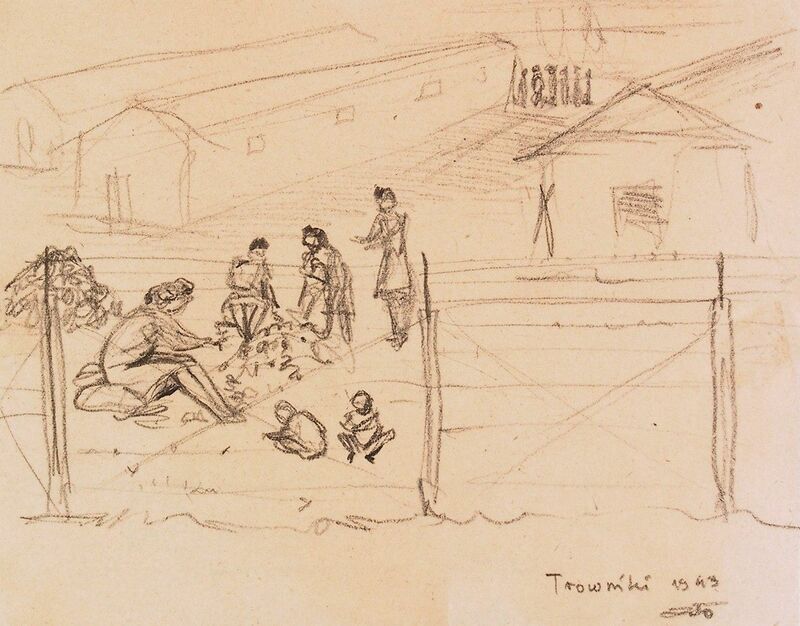 On the back of this drawing is written in pencil in Polish: "Camp Sobibor. A high fence of intertwined dry branches hides the gas chambers from view. A narrow gauge side-track leads to the camp. Only half of the trains can use it. The transport must be split in two. Unloading takes twenty minutes". 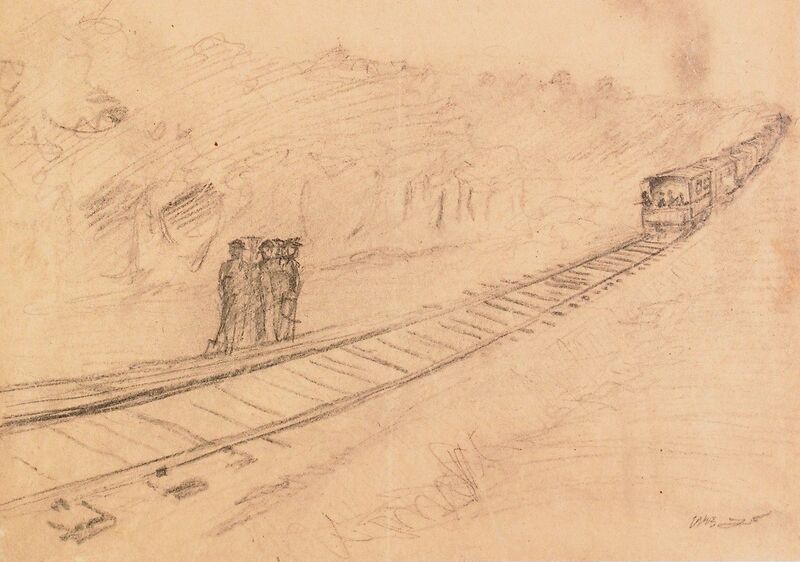 On the back of this drawing is written in pencil in Polish: "A transport on Uhrusk station. A hole in the window, blocked with barbed wire. They know...". On the back of this drawing is written in pencil in Polish: "Small, high window in a freight car. They ask for water. The guards are watchful. We are on a train on a parallel track. I draw slowly on a newspaper." 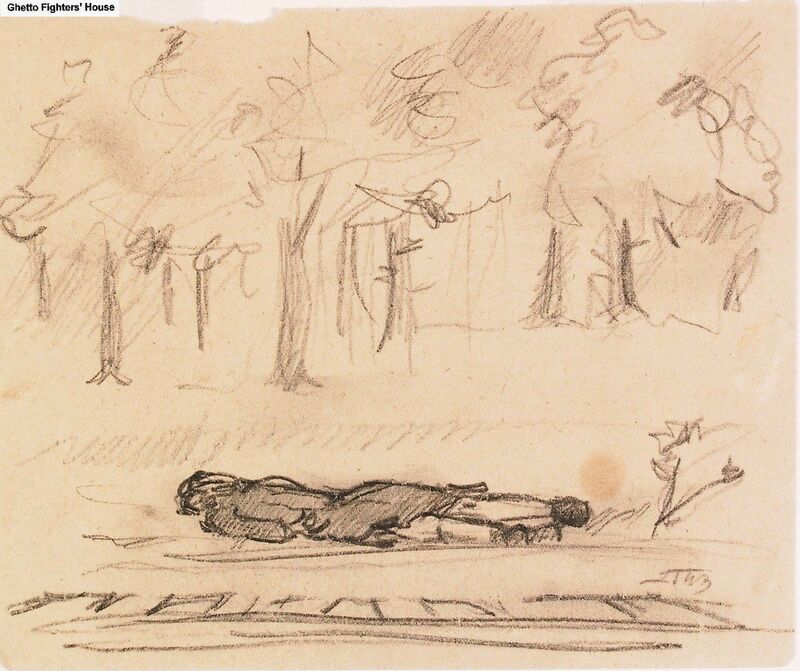 On the back of this drawing is written in pencil in Polish: "Train from the Netherlands. They are oblivious. A Pullman-carriage, luxurious. They will be dead in one hour. Uhrusk". On the back of this drawing is written in pencil in Polish: "Jews waiting for the train from Chelm; Ukrainians and SS have brought them from the camp to collect packages". 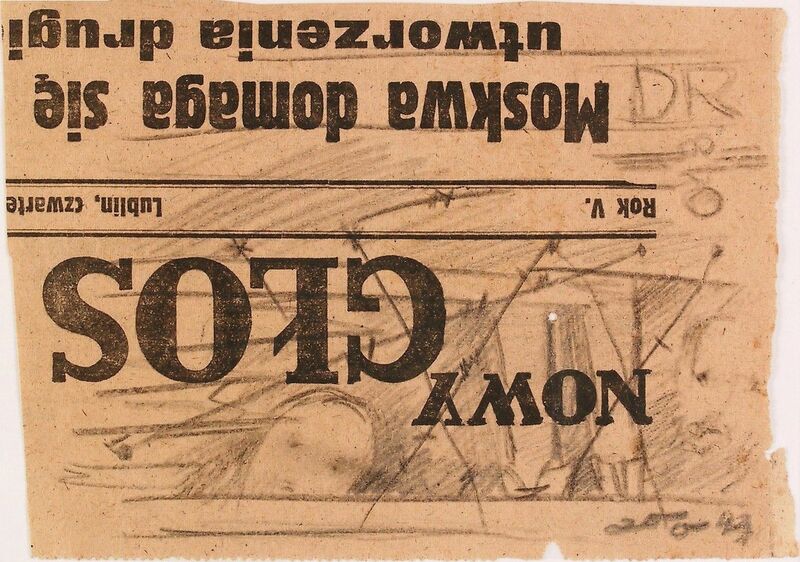 On the back of this drawing is written in pencil in Polish: "On the way to Sobibor. Jewish women from France with children are sorting potatoes. A camp next to the station. I saw this through the window". Op de achterkant van deze tekening staat met potlood in het Pools geschreven: "A group of young Jewish women from the Piaski ghetto are deported to Trawniki. It is minus ten degrees [Celsius]".